If you’re done with the standard stuff and ready for a bit of an upgrade, you may want to take a look at our advanced vaping kits. These powerful vapour kits are a total step up from the normal vaping equipment, including various tools to make your vaping style different than before. If you are clued up on your vaping kits and are looking to produce ever-expanding clouds of vape with something new, then you are definitely on the right page for your ideal advanced vape kits! What makes advanced vape kits so great? A variety of tanks. A variety of power. A variety of choices. Each and every vape kit of this calibre has a unique design and set up. With either removable or internal batteries, their own individual setting choices and an array of extras to equip your e-cig with, no two kits are the same. When shopping through our range, without a doubt, you’ll find the perfect kit for your preferences. We only partner with the best at Cloudstix. Our advanced vape kits are supplied by high-end vaping brands such as Aspire and Vaporesso, meaning you only get the greatest vaping kits from us. The mods on high-quality e-cigarettes are the best. The mod is what gives your vaping that extra boost, with extra settings, better power range and upgrades in technology. They come in a variety of different shapes and sizes, with designs to suit both those with simple and unique tastes. Over the last few years, e-cig technology has evolved significantly - with added extras to improve your overall vaping experience. For example, the box mods on our advanced vaping kits incorporate the likes of touchscreen technology. Our electrifying Luxe Kit allows you to operate your e-cigs' touchscreen mod like a high-end smartphone, with vibrating feedback and quick-acting responsiveness. Once you have experienced advanced vaping with an upgraded mod, you won't look back. Aspire Feedlink Squonker Kit FINAL DISCOUNTS NO.. 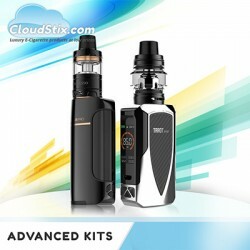 Aspire Typhon Revvo Kit The Aspire Typhon Revv..
Vaporesso Polar Kit - IN STOCK NOW Vaporess..
Revenger X Kit - Vaporesso The Revenger X K..
Swag Kit UK - Vaporesso Introducing the Vapores..